One of the causes that cause our blog traffic less visitors is the existence of broken links or links that are disconnected on the page posting articles. Of course such a thing is not expected by the owner, therefore need a way out the right and accurate in order to overcome the problem broken links. Based on my own experience, the source of broken links is one of them caused by repetition of publication of article post. Initially the article has been published but because you feel there is something inappropriate on the post page, you change the title of the article and published again. The result is that the first publication you do on the same post will already be indexed by search engines so that it is stored in cache memorynya and second publication as the results of the improvement will not be indexed again. Other sources, can come from other link sites where your blog may exchange links. But it turns out that blog has never updated the article again. I have high confidence you may have encountered a 404 error message when visiting a site. This is a sign of broken links to the site. To solve the problem broken links like this is quite easy that is to remove the initial publication that has been done on the cache memory search engine using the tool webmastertool innate google. If you often play with webmastertools innate google it would be amazed to see the google index section. Usually in the section the number of articles posted and the number of indexed google different. The reason for broken links that already many detected by the robot google search so that automatically affect the number of posts indexed articles. Indeed, the number of articles posted and indexed search robots google should be as much. Therefore, avoid exchanging links between blogs because we do not know whether the owner is serious to manage his blog or not. Then, do not like to change the title of the article frivolously and blindly. Disappointment, that's for sure because the page searched does not show up. But of course we will never know, how many broken links that exist in our blog. If it's just about the amount, it's not the way a professional blogger. Good thing now has many tools online application that can be used to know there is or not broken links in blog and how many amount. For those who seriously want to use it, try taking a walk to some of these sites. Put your blog url in the checklink form on the 3 sites and enter. If in your blog found broken links it will be marked with red. This way I recommend more, because no need to bother again to check and remove broken links by using some applications. Simply done using one app and in one location only, two issues will be completed at once. What if the broken links were left alone not deleted? 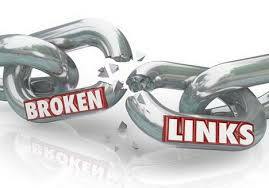 In my opinion do not do crazy ideas like that, because the influence of broken links very strongly against SEO.